Yesterday was supposed to be Fortuna’s birthday, but she didn’t age up into a child for some reason. This may actually be a good thing for the Family since it will give them some bonus time to earn some more money they will need to expand their house. Their personal goal is to earn §40,000 simoleons before starting the renovations. Pawel wakes up extra early because he desperately needs a shower. Off he goes into the water. He grabs some leftovers for breakfast. It’s so early that the moon is still visible! He works on his screenplay he started last nigh until he finishes, then he sends it to the publisher. The sun is just now coming out! After he uses the toilet and it becomes dirty so of course he cleans it, neat is one of his traits. Fortuna has woken up and is crying for breakfast so Pawel feeds her. Today’s reports, funds are now §41,397 simoleons. Rosabelle needs to gain level 2 logic in order to get promoted at work. 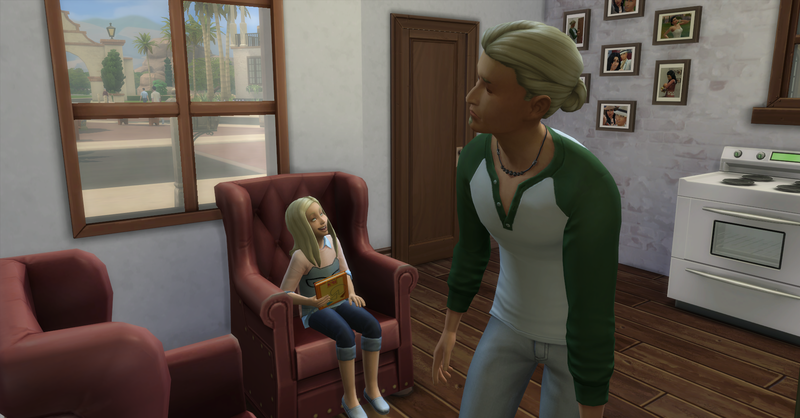 They have no logic items at home so Rosabelle and Pawel travel to the library so she can learn logic and Pawel can continue working on his book. Fortuna goes to the Day Care Center while they are away. Rosabelle is almost able to achieve level 2 logic before she needs to leave to go to work. Pawel heads home once she leaves for work. The moment Pawel walks in the door, Fortuna ages up into a child! This is a fortuitous event because it will allow them to wait for Rosabelle to return home with her salary before renovating the house! 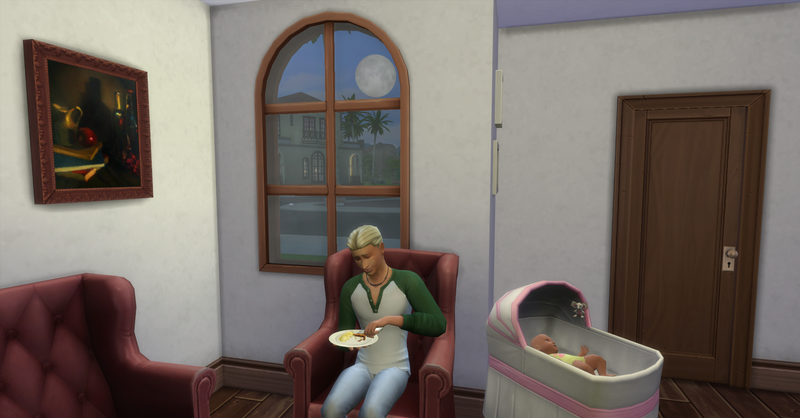 They sell the crib for §150, funds are now §41,547 simoleons. 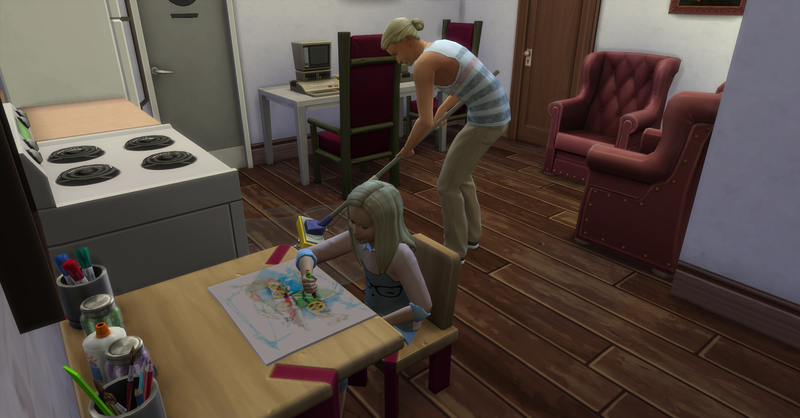 Her childhood aspiration is Artistic Prodigy and her trait is Creative. Fortuna gets a new wardrobe and she looks just like Pawel, although she got her mother’s lips and eyebrows. Pawel is tired from getting up so early this morning so he takes a nap while Fortuna works on her homework for school tomorrow. Fortuna is stoked that she finished her homework. 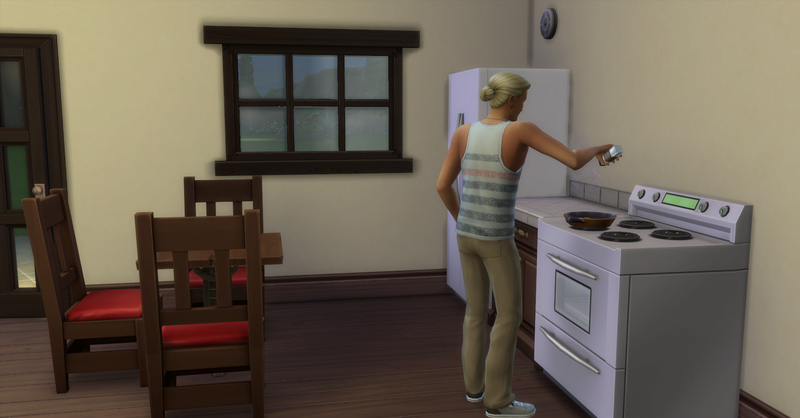 Pawel wakes up and cooks eggs (§10) while Fortuna draws. 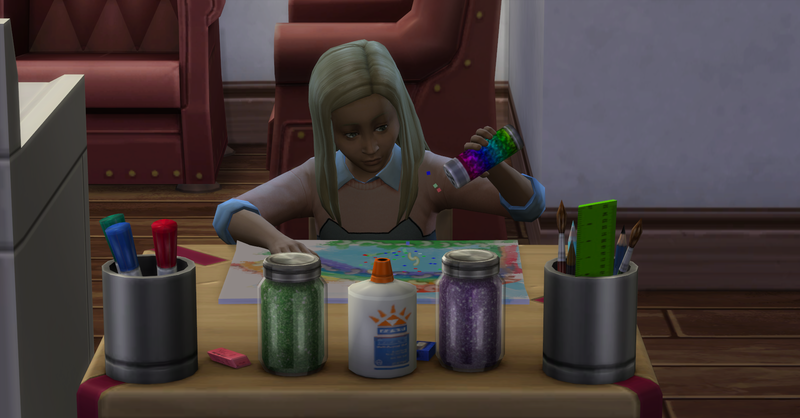 She sells one of her drawing for §1 simoleon, their funds are now §41,238 simoleons. 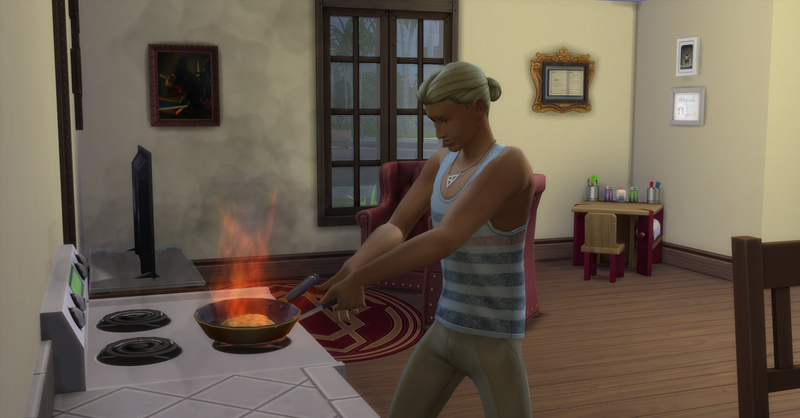 A fire breaks out on the stove! Pawel thinks the best thing to do is beat the pan with his spatula! And he is successful! Oh and the fridge broke when he got the ingredients for the eggs. But it won’t be fixed tonight, they have other plans. Pawel being the neat sim he is mops the puddles up from the broken fridge. 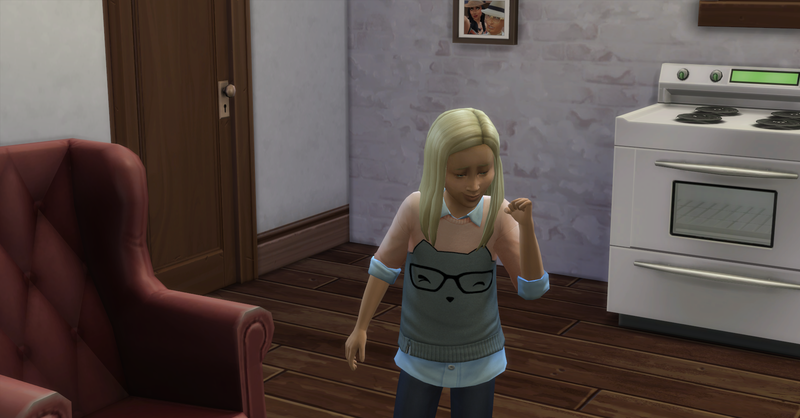 Rosabelle comes home from work with §480 in regular pay, their funds are now §41,718 simoleons. 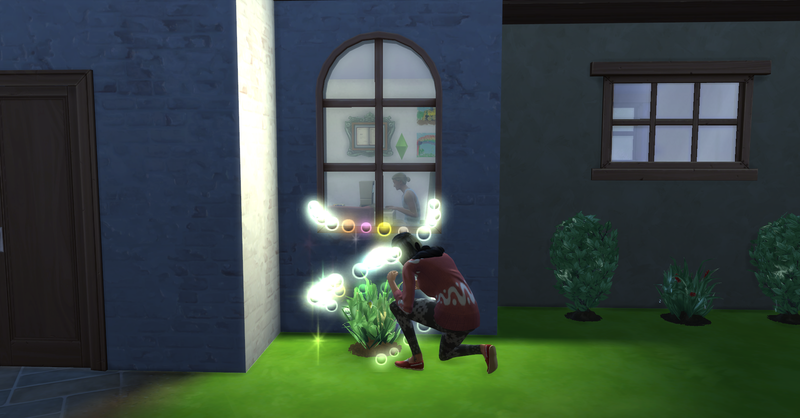 When she gets home she tends the garden and evolves the lily flower to good quality. 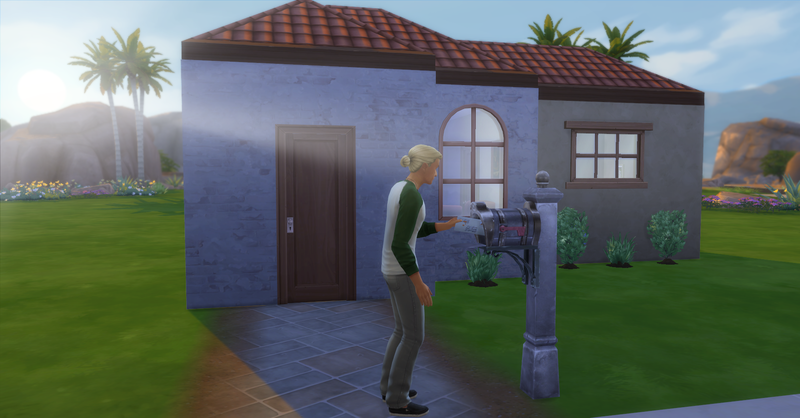 Fortuna’s fortuitous late birthday allowed them to earn an extra day’s worth of simoleons before renovating the house! With Rosabelle’s pay from work today they have reached their personal goal of §40,000 simoleons to start renovations on their house. Fortuna is also getting sleepy and needs a bed to sleep in. They sold quite a few items from the demolition during the construction such as doors, wallpapers and flooring. They also sold all their sink, shower, broken fridge, and counter to upgrade those to better quality items. The amount sold was §827 simoleons, their funds are now §42,545 simoleons. They expand the living, kitchen and dining areas as well as move the master bedroom around, adding another bedroom and re-configuring the bathroom. They also upgraded the bathroom woth a new shower, the nicest one available and also got a nicer sink and mirror. They bought a new, nicer fridge to replace the broken one for the kitchen and replaced the counter with a nicer one too. The created a real living area with their two promotional chairs and a new TV and coffee table for it to sit on. They also decided to buy themselves a new bed, The Single Double Misson Bed, so they will be more rested for work. They move their old Glamping bed to Fortuna’s new bedroom. 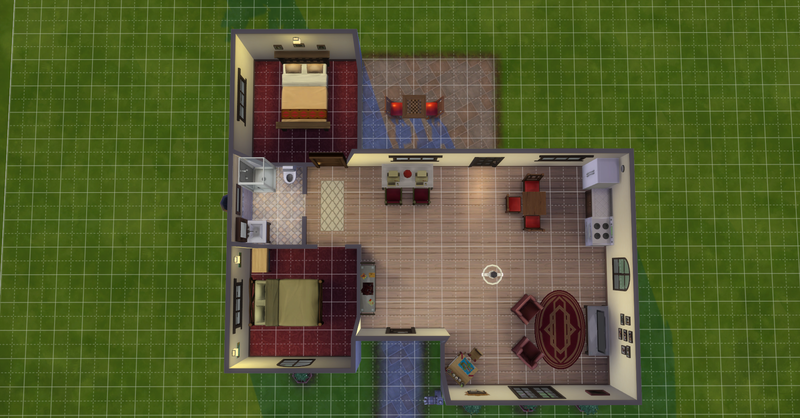 After all the construction and renovation is complete, they have spent §14,364 simoleons! Their funds are now § 28,181 simoleons. Everyone goes inside to checkout the newly renovated house! Fortuna is tired and immediately goes to sleep in her new (hand me down) bed. 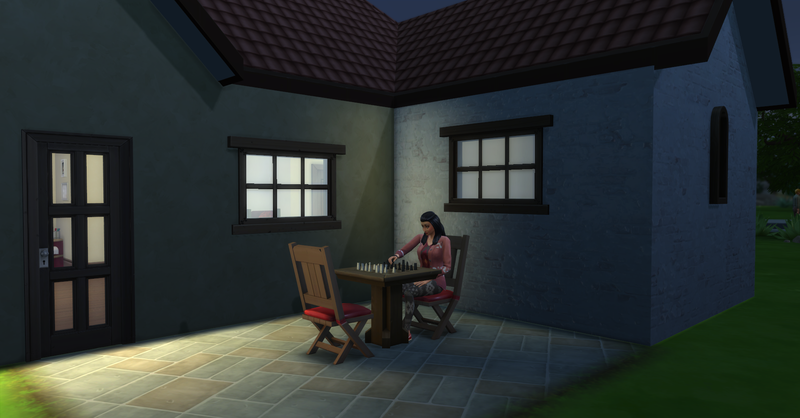 Rosabelle goes to checkout the new chess set and work on achieving level 2 logic for her work promotion. Meanwhile Pawel makes more scrambled eggs (§8) because he thinks that their leftovers were thrown away when they donated their broken fridge. Their funds are now §28,171 simoleons. Luckily Pawel beats this one out too. Yikes two fires in one day! The Prospero founders enjoy their time together and their new tv! Bed time in their new bed and bedroom. This is the end of week 4 of the challenge, there were suppose to be 2 week updates on the actual achievement BUT it stopped tracking their progress sometime this week. I believe that it may have come from accidentally being in full CAS edit mode at some time, maybe when I redressed Fortuna, I’m not sure. So I’m going to have to track it myself. I think that the achievement that I showed 2 weeks ago (see below) calculated the total net worth based on their household funds and property value. Therefore I am going to use those numbers from now on to calculate the Prospero’s net worth. Progress from 2 weeks ago, household funds at the time were §6568 simoleons, so it had to be taking the property value into the progress. The Sims Announces Free New World! I agree, she came out looking great. I think that good genes help! 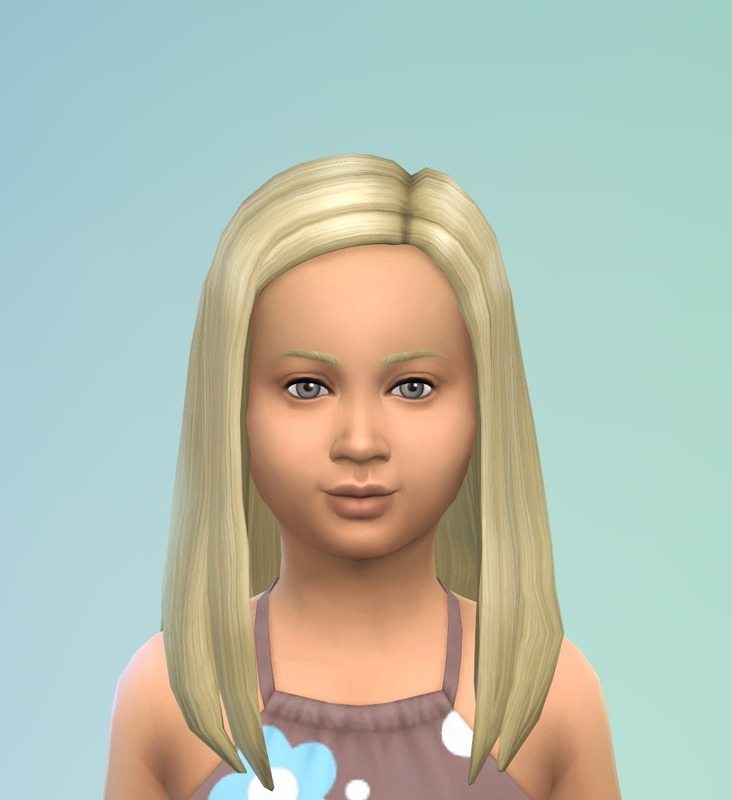 I can’t wait to see her as a teen! You are doing an amazing job having them steadily increase their family funds! It is really intriguing to follow how you are managing. Fortuna is beautiful. 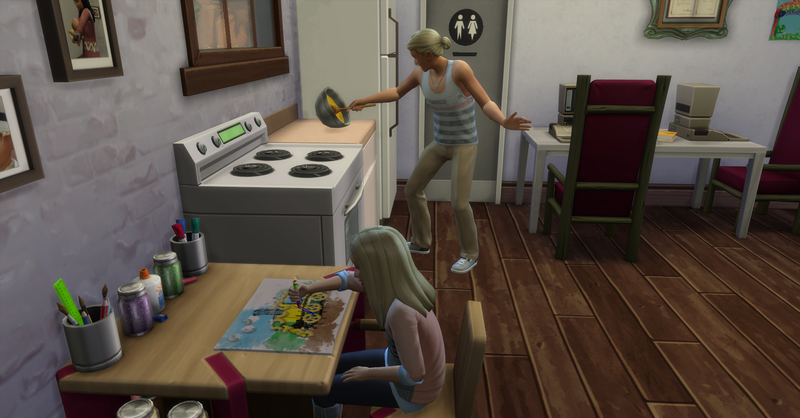 I really love the picture of her at the art table next to her dad cooking, and all the family photos on the walls look so adorable. Especially the picture of Rosabelle holding baby Fortuna. 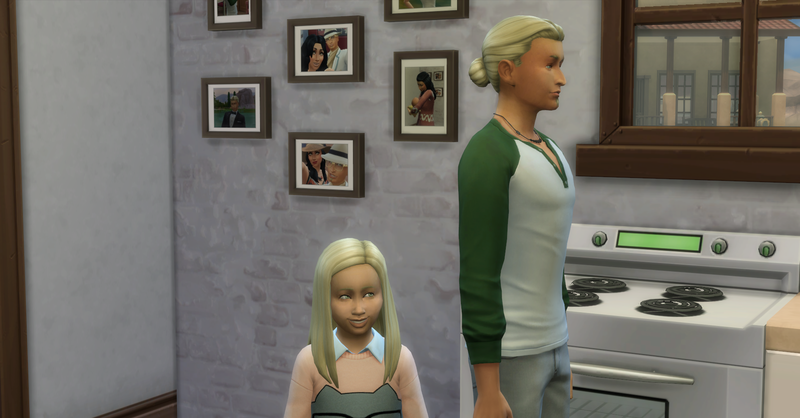 I need to take more snapshots of my sims for their walls! The new house looks SO pretty, front and back. Thanks, they have been doing very well with their family funds and Fortuna grew into a beautiful girl who looks just like Daddy. I love the snapshots and the best part is they are free! And they get something to remember their special moments and to put on their blank walls! Hello, I have been simming since the Sims 1, and have always played without custom content and mods in my games. I wanted to share my "vanilla" playing style with others and show that being a vanilla simmer isn't boring! 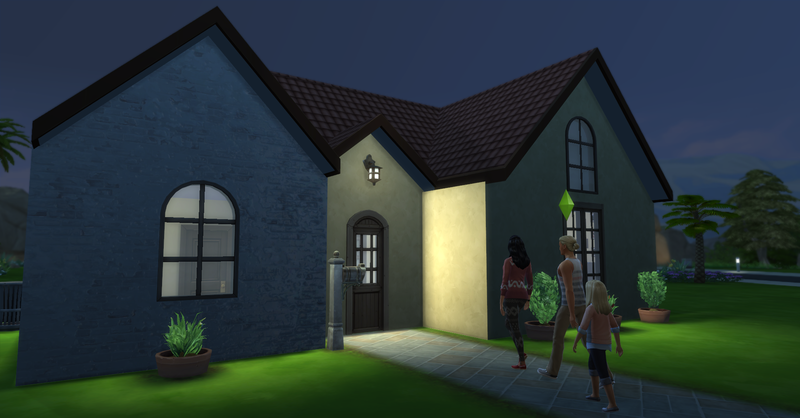 Create a new town with your family legacy! 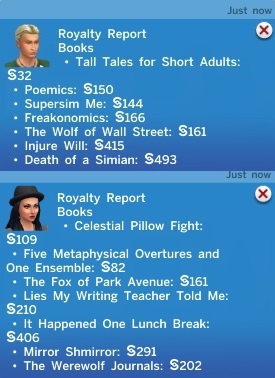 A place where you can see silly little stories from my Sims 4. For all my sim things. Stories, Sims, Writing Advice, Gaming and so much more! Follow the adventures of my Sims!! Can we reach 1million simoleons with random generation restrictions?